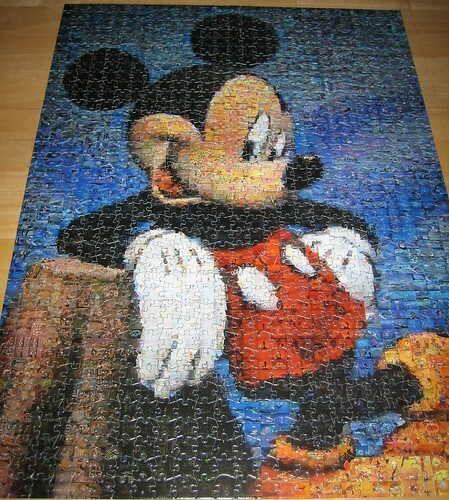 A few years ago, I received a cool Mickey photographic mosaic jigsaw puzzle. I don't usually work on jigsaw puzzles - but in this case I was drawn in by the thousands of single-frame images from Walt Disney Feature Animation. If I had known in advance how much work it would be, it would probably still be sitting in the box. I really don't know puzzle strategies all that well, so I started by trying to sort the pieces into piles based on the movies depicted on each one. In retrospect, I doubt this was the most efficient way to solve the puzzle, but it did give me hours of brain-teasing (and eye-straining) fun trying to identify film frames based on the image fragments on each piece. NOTE -- The fact that each puzzle piece contained parts of three or four different film frames makes this much more difficult than it sounds. Now I just need to find a good way to mount this for display.